Andrine Pierresaint performs her spoken word piece, “Knives” at the Amplify grants reception at the Mass State House earlier this year. Andrine is a Youth Leader at Books of Hope, which is funded in part by Mass Cultural Council’s YouthReach Program, and a 2018 Amplify Grant Recipient. Andrine’s Artist Statement: Writing about my personal experience with sexual assault has been very difficult. But I saw a documentary on UN peacekeepers in Port-au-Prince, and my family has had many experiences with sexual assault. Haiti has a long history of constantly being taken advantage of, by withholding this information, I feel I would’ve been contributing to it. Youth activist and writer Ruby Russell of Books of Hope performs her poem “Shells” at the National Arts in Education Week celebration at MassArt on September 14, 2018. The event was co-hosted by Americans for the Arts and the Arts for All Coalition. Dubem Okafor, Institute of Contemporary Art Teens Leader, performs at the Creative Youth Development Showcase hosted last year by Mass Cultural Council and EdVestors. Hyde Square Task Force performs at the Creative Youth Development Showcase hosted last year by Mass Cultural Council and EdVestors. Angkor Dance Troupe performs at the Creative Youth Development Showcase hosted last year by Mass Cultural Council and EdVestors. META Fellow Ryan Solero performs Billie Jean with students from Lawrence Public Schools’ 10th Grade Academy. Our Music Educators and Teaching Artist (META) Fellowship Pilot Program is a two-year program focused on enhancing the quality of music teaching and learning in school and community based organizations throughout Massachusetts. 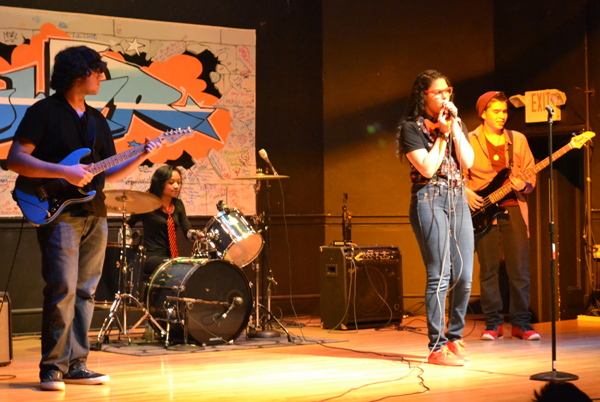 OrigiNation performing at the Creative Youth Development Showcase hosted earlier this year by Mass Cultural Council and EdVestors. Next week, Edvestors and the Mass Cultural Council are partnering to showcase the creative contributions young people make to the Commonwealth of Massachusetts. Join us on Monday, July 24, 2017 from 6-8:30pm in the lobby of 10 St. James Ave., Boston. The showcase will celebrate the Massachusetts creative youth development community and welcome the Creative Youth Development National Partnership as they hold their national stakeholder meeting in Boston. RSVP to attend this free event.